The lodge features a full service restaurant with local and international cuisine, gift shop, heated hot tubs, an infinite edge swimming pool, walking trails, a butterfly garden, horseback riding, a game-room and outdoor playground for children, fitness room, steam sauna, and free wireless high speed internet access. Guest rooms and suites feature cable TV, telephone, coffee maker, clock radio, and all have private baths. Complimentary crib and wheel chair are available on request. Economy Rooms - LODGE: Economy rooms are equipped with one comfortable queen-sized bed. These economic rooms are located just off the lobby with an interior lobby view. 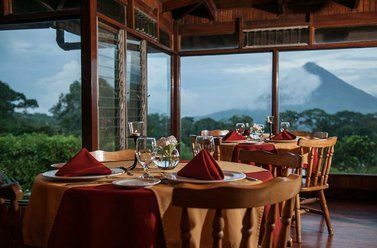 Although they have no view of the Arenal Volcano they provide easy access to the lobby and restaurant, making them a popular choice for guests. All guest rooms and suites feature coffeemaker, clock, cable TV, WIFI, complimentary digital safe, and a private bath with hairdryer. Complimentary WIFI access available in the main lobby. Arenal Lodge provides guests with the excitement of staying in an authentic rainforest lodge with breathtaking panoramic views of Costa Rica’s famous Arenal Volcano and Lake Arenal. Guests will enjoy a casual and relaxed rustic lodge setting with the added value of a complimentary breakfast daily. 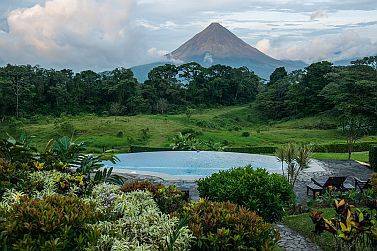 Located on 2000-acres of beautiful tropical rainforest, the lodge is situated near Arenal Volcano National Park. 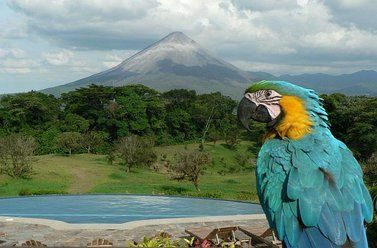 The lodge is surrounded by rainforest - housing hundreds of exotic birds, small animals and the beautiful tropical flowers and trees of Costa Rica. and is it's own local tourist attraction due to its exclusive location with breathtaking panoramic views of Arenal Volcano and Lake Arenal. (except Christmas Season 12/21/14 - 1/4/13 and 12/20/14 - 1/3/15 when cancellation is required 7 days prior arrival). 2. If cancellation is made 3 days or less before the arrival date, the deposit will not be refunded. 3. In case of NO SHOW we will charge the total amount for all the nights reserved. $25.00 (+13% tax) Extra person charges apply to all guests over the age 13 and are collected at check in. Children age 0-12 stay free when sharing with a paying adult in the same room. Hotel Arenal Lodge is situated near the Arenal Volcano National Park in la Fortuna of San Carlos, in the province of Alajuela, which is in the northern region of Costa Rica. 1. Take the Highway towards San Ramón, approximately 56 Km. 2. Exit at San Ramón on right hand and drive straight down the main road, until you reach a dead end. Turn left 2 blocks, then right onto the road to La Fortuna. 3. Follow the signs to La Fortuna and Arenal. 4. Once you are in La Fortuna, keep driving in direction to the lake. The entrance to Hotel Arenal Lodge is 200 meters northwest of the dam of the lake Arenal.